All the little elves are excited that the winter carnival is coming. 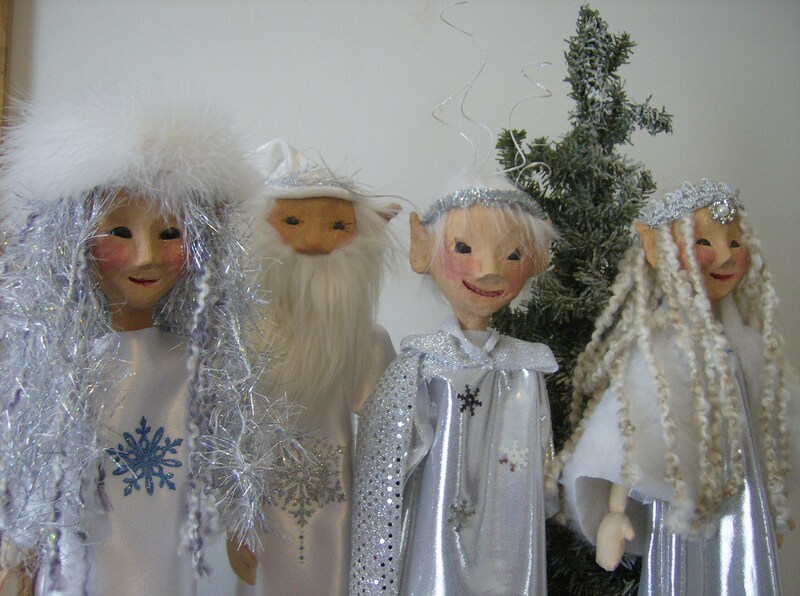 They love to wear their silver and white clothes with snowflakes decorating everything. Even Chrystal has decorated her hair with sparkles! They are going to build ice sculptures of chipmunks wearing hats and coats, and have contests with squirrels skating on the lake. 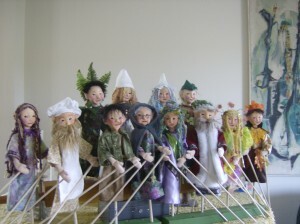 A fox-drawn sled will carry the elves around their tiny town and in the evening they are having a bonfire and hot apple cider for all. By the way, even Cooperstown is having a winter carnival for humans and the farmer’s market will be open on Sat. Jan. 28th with all sorts of fun and festive things for the carnival. 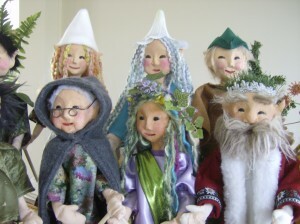 Here’s some of the elves that will attend the farmer’s market that day. Chrystal is in the front, showing off her sparkly hair. It gets dark early and the elwen are busy decorating the large hall with candles and strings of dried berries and nuts. A large tree has been pulled in through the door and all the little elwen stand and stare at it as the older elwen hang bees wax decorations, ribbons and bows all around it. 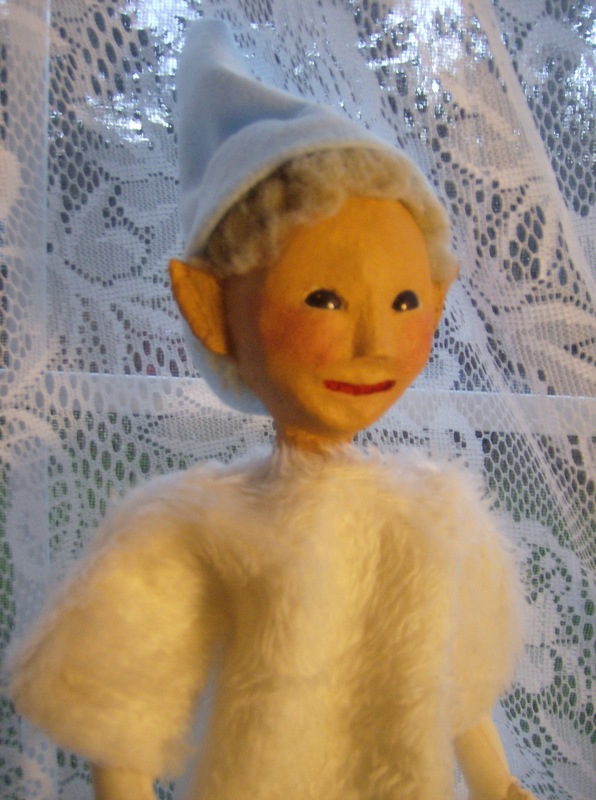 The large elf is due to arrive December 24th when all the little elwen sleep. Then, Christmas morning they wake to find boxes and bags filled with treasures. 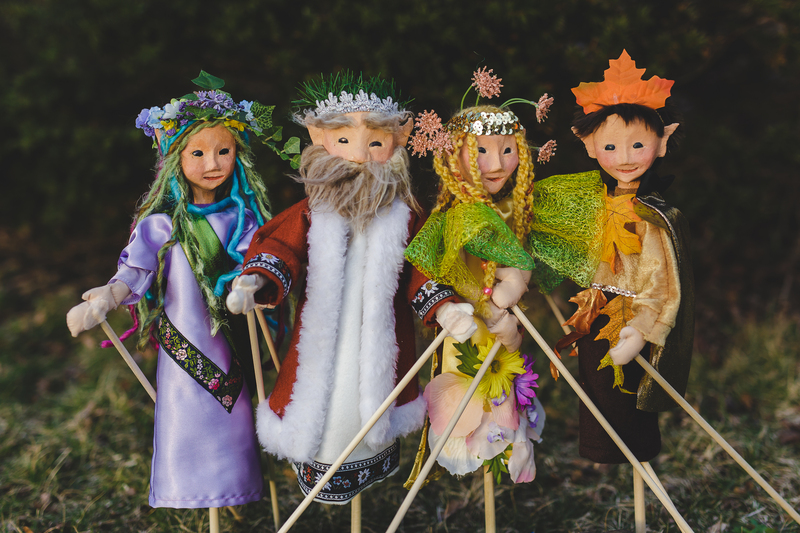 Little gnome toys, dance rings of ribbons, finger puppets, rocking chipmunks (they work the same as rocking horses that humans have), fairy houses, and even candy canes fill the space beneath the tree. 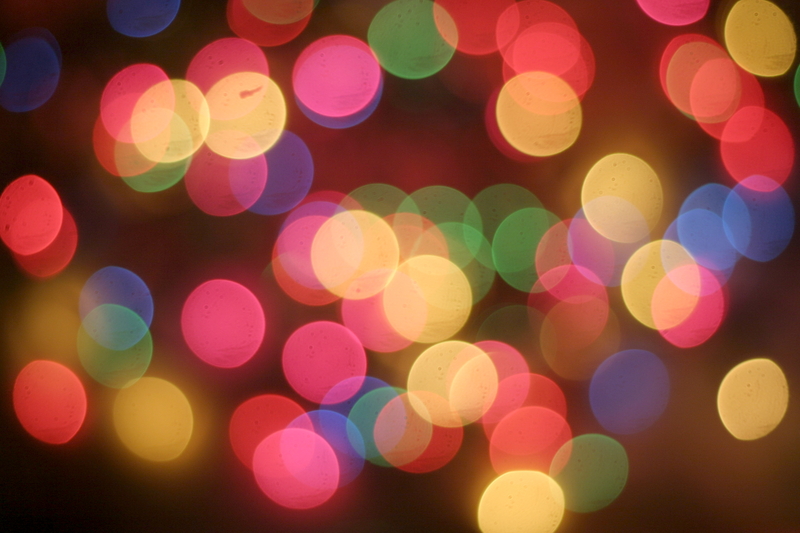 Oh, the joy and sparkle in each little eye! It’s going to be a wonderful Christmas this year. 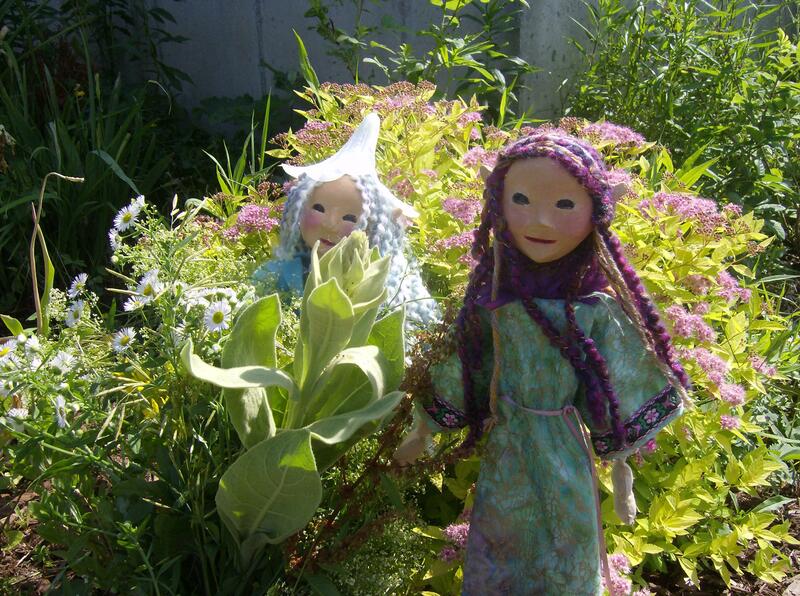 Willow and Amethyst had a race to see who could gather the greatest variety of flowers in an hour. Amethyst won by a landslide. She picked all the weeds that were blooming around the village. Willow forgot about weeds and only picked blossoms from the gardens. Such a fun day! 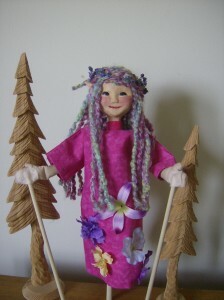 Now the village has plenty of bouquets to use in their shops and homes. 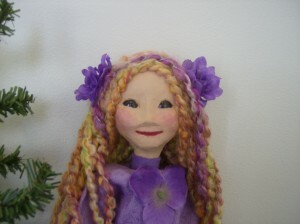 Amethyst is turning many of the flowers into garlands to tie over the doorways. So pretty. Finally – Super Summer weather!!! After such a nice, mild winter it was so hard to enjoy the long, cold spring. 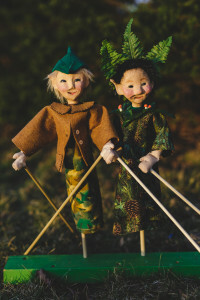 All the elves and chipmunks hid in their houses and let the weeds grow. Now they have a yard filled with dandelion fluff. 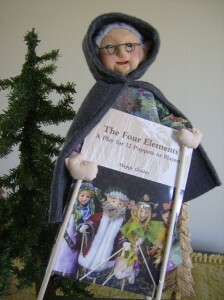 The elwen don’t mind. They gather all that fluff for pillows and mattresses. I’ve seen them running across my yard in the evening, gathering the puffy seed-heads into their little brown sacks. 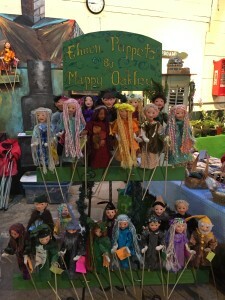 In the meantime, the puppets are having a wonderful time at the Cooperstown Farmer’s Market. Here are three new ones that have joined the family. Now, time to plant radishes and cucumbers. Those are the ones the elves like best. The play is finished and printed. 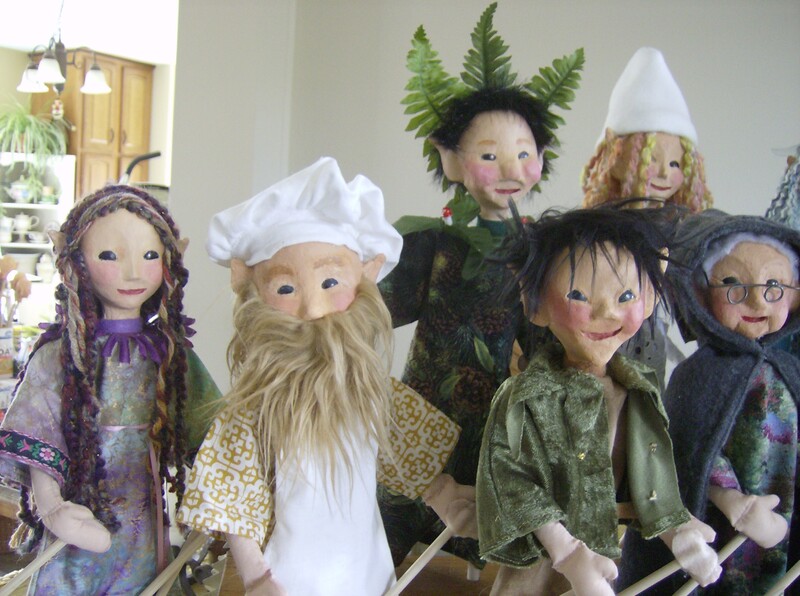 The puppets are made and waiting for schools and groups to order. Check it out. 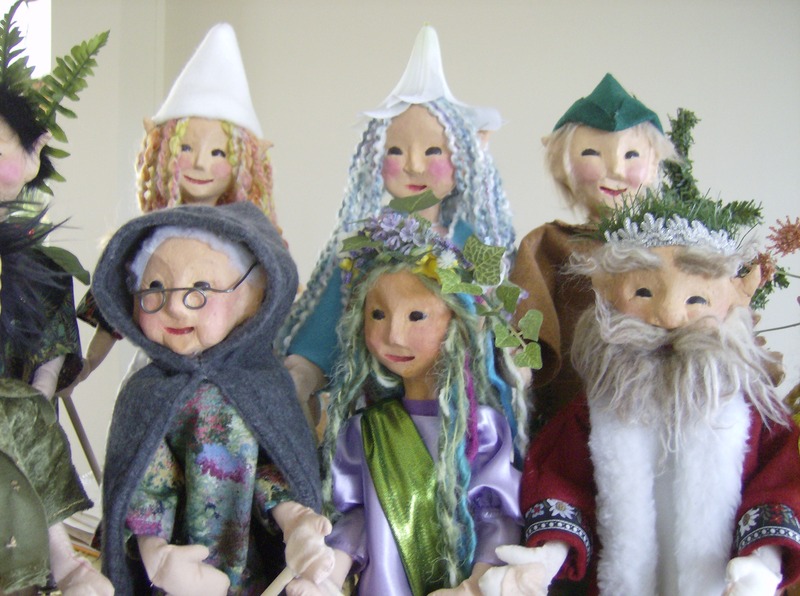 These elves have been very busy practicing their parts. Left: Oak and Jack ready for an adventure. Right: Willow, Nickolas the baker, Jack, Tom Trickster, Cedar and the Wise Woman. 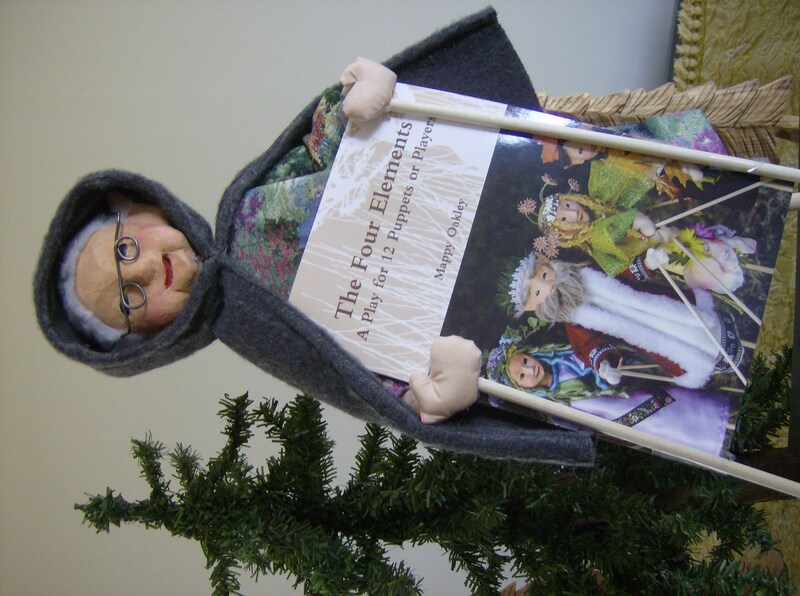 Soon I will have a printed copy of the puppet play ‘The Four Elements’ to show you. 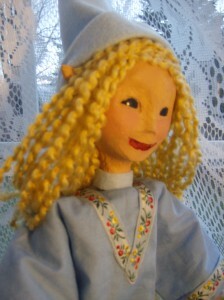 The folktale takes place in an elven village. 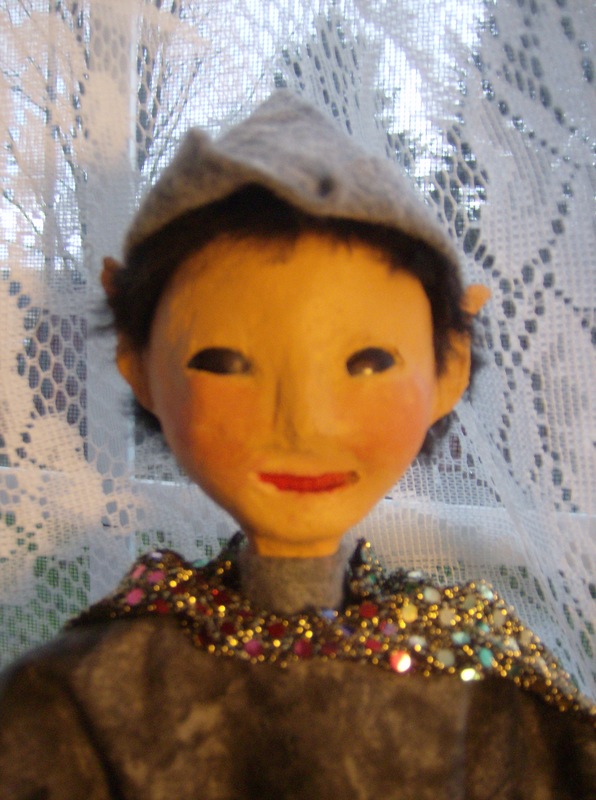 The elves are in need of food and King Winter can’t help. 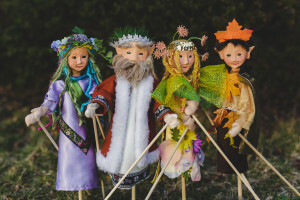 The wise woman sends the villagers out to find Queen Summer, Princess Spring and Prince Autumn to get the elements of those seasons to help the villagers open the way to the food source they need. These four puppets are, from left to right, Princess Spring, King Winter, Queen Summer and Prince Autumn. 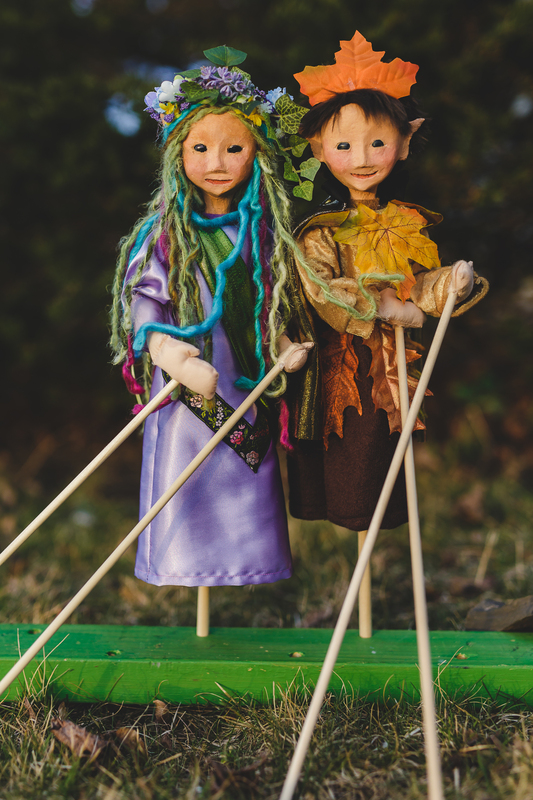 Here are the new puppets that will be included in a kit. 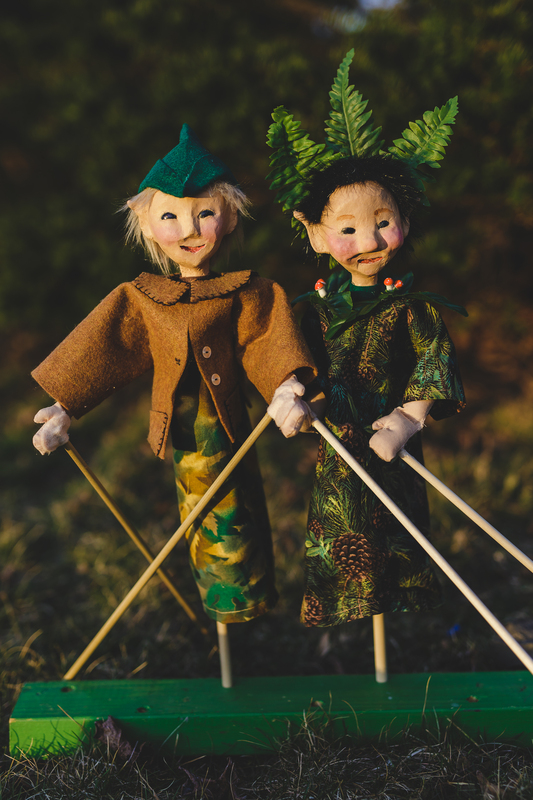 The kit contains a full puppet play with instructions, a DVD on how to manipulate the puppets and a short skit, 12 puppets and all the props needed to perform the play, everything you need except the stage. There are instructions on a few different stage ideas from very simple to more complex. This kit will be perfect for schools and clubs, theater groups, etc. 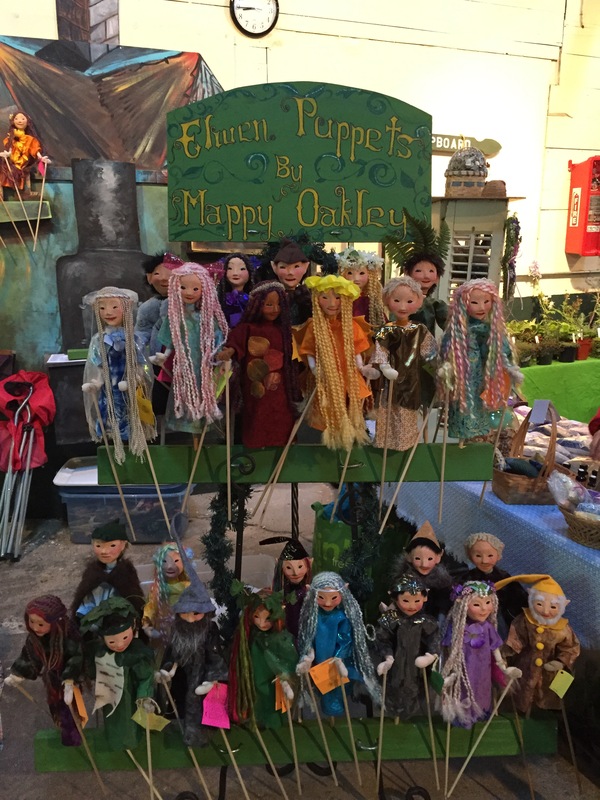 All the puppets and gnomes, Robin Hood hats, Gnome homes and Woodland pillows for sale at the Cooperstown Farmer’s Market. 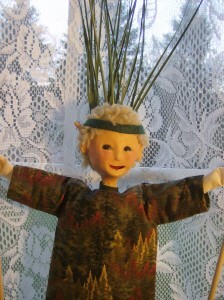 I am taking a break from the Market until Feb. 6th for the Cooperstown Winter Carnival. Be sure to come for that! There’s plenty going on around Cooperstown the entire weekend. 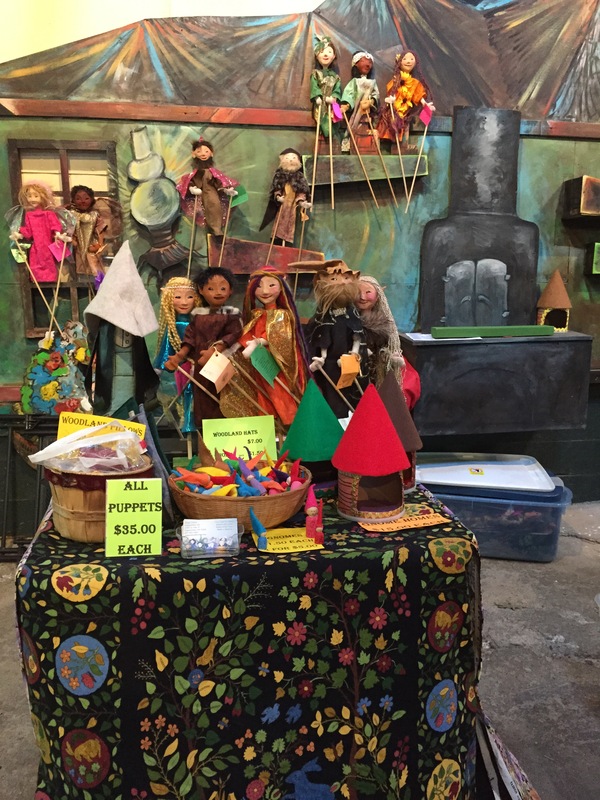 Winter hours at the market are 10am to 2pm and there are still lots of fun things to see there, and always yummy food! 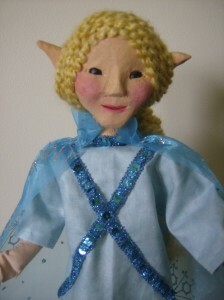 I am busy making dragons and little marionette puppets for the new season. Nyx and Nissa are baking cookies! 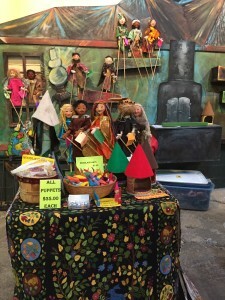 Rod puppets for sale. 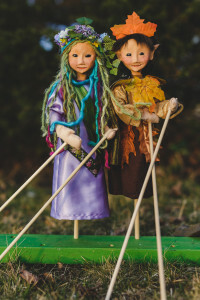 Brother and sister, these two run the Blue Flower Bakery in their elwen village. Nyx specializes in hot chocolate and decorating the store. Nissa is always busy making cookies and other treats for the elwen children. At this time of year they work many hours to make all the holiday goodies. Elwen love to celebrate with food! Two More Saturdays before Christmas. Yikes! Remember, the elwen are the little folk that live in the forests and meadows around our villages and farms. They are very small. 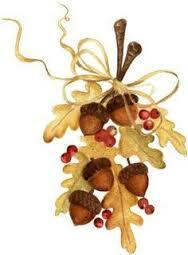 Some of them are only 6 acorns tall. Of course the rod puppets are bigger. 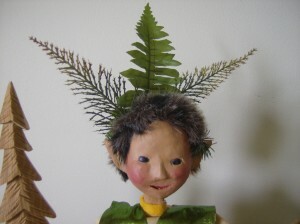 It would be hard to see them if they were as small as the forest elwen.